Bill Evans Time Remembered is a 90-minute documentary film, produced by Bruce Spiegel which tells the story of Bill Evans’ turbulent life and his contribution to jazz music. The film was self-funded by the producer who traveled and interviewed approximately 40 people over a 7 year period of time. Several well renowned musicians are included in the film including Tony Bennett, Dr. Billy Taylor, singer Jon Hendricks, and jazz pianist Bill Charlap. The film also compiles a wide range of historical information about the jazz pianist including his first TV recording which appeared on CBS Look Up and Live in April 1958, playing Come Rain or Come Shine. For the last 25 years, Bruce Spiegel has been a producer and editor at CBS News/48 Hours. In 2002 he co-produced the award winning TV documentary “9-11” which won both an Emmy (2002) and Peabody Award (2003). In 2012, alongside Wynton Marsalis (jazz musician and artistic director at Jazz at Lincoln Center) and Hugh Masakela (South African music legend), Spiegel co-produced a CBS News/48 Hours TV documentary titled “Nelson Mandela: Father of a Nation”. The documentary explored the South African music that was used for Nelson Mandela’s eulogy, and won The National Association of Black Journalists (NABJ) Excellence Award in 2014. In the late 80’s Spiegel wrote and edited “Machito, A Latin Jazz Legacy”, a documentary that chronicled the rise of Latin music in the 40’s and 50’s. The film has screened worldwide, and was the Jury Prize Winner at the 1986 San Antonio Film Festival and the First Prize Winner at the San Juan Film Festival in 1988. In 2006, he directed and produced “Long Road Home”, a documentary about John Malangone, a baseball phenomenon destined to be the next great Yankee catcher. The film won first prize at the Baseball Hall of Fame Festival in 2007. 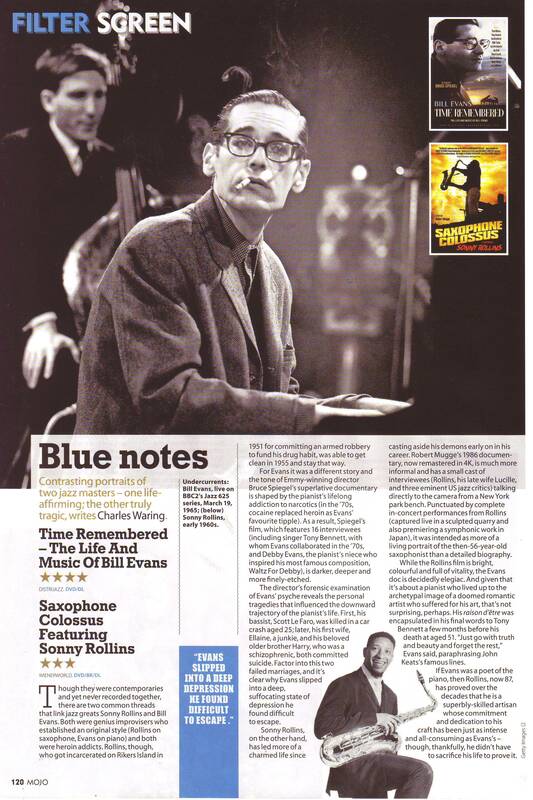 Spiegel’s latest work, a documentary titled “Bill Evans: Time Remembered” was completed in 2015, and tells the story of Bill Evans’ turbulent life and his unprecedented contribution to the jazz community. "Three Reviews - CIMMFest in Chicago"
"DVD Review - Time Remembered"